bring to the market, new and innovative supplements. or our extensive range of Vitamins & Minerals, Natural Extracts, Probiotics etc. packaging, right through to shipping. 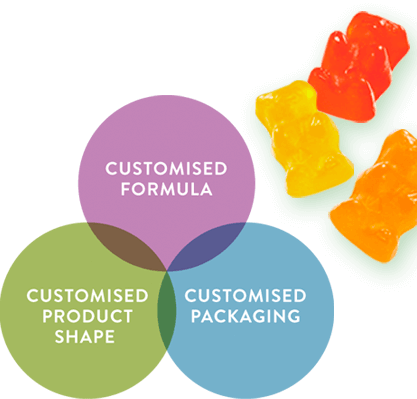 Product shapes can be used to highlight the appeal to children or adults. logo or image, or even a shape incorporating a brand name. Using various shapes can give you a distinctive presence in the market place. The world’s leading Nutrient Gummy Formulae. Sugar Free vegan:Absolutely NO animal product or cane sugar. All products manufactured in an allergen free environment. Please contact Allsep’s for details. government and as a provider of excellent retail information. and ongoing operation of comprehensive, HACCP based Food Safety Programmers. our current Action Plan which can be viewed by clicking on the link. helps companies demonstrate safety, confirm compliance, enhance sustainability, manage transparency, deliver quality and performance, strengthen security, protect brand reputation, build workplace excellence, and advance societal wellbeing. Some of the services offered by UL include: inspection, advisory services, education and training, testing, auditing and analytics, certification software solutions, and marketing claim verification. The Food and Drug Administration is responsible for protecting the public health by ensuring the safety, efficacy, and security of human and veterinary drugs, biological products, and medical devices; and by ensuring the safety of our nation's food supply. The Gluten-Free Certification Organization (GFCO), a program of GIG, is a leader in the verification of quality, integrity, and purity of gluten-free products. One of the top certification programs in the world, GFCO inspects products and manufacturing facilities for gluten, in an effort to maintain strict industry standards. GFCO has currently certified over 30,000 products in 29 different countries. Please contact Allsep’s for further information's of HALAL certified products.